Within the past year, I have made the decision to lead a completely natural and organic lifestyle. I have changed my eating habits due to allergies but I’ve also changed the products I use. I see a holistic doctor and have found out that the products I have been using for so many years have been harming my body. 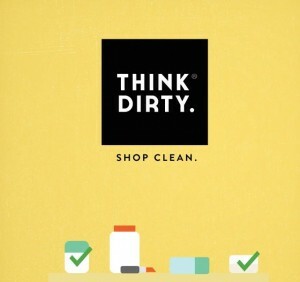 I didn’t know which products I should keep and which to toss but with the help of the Think Dirty App, it made my life a lot easier. 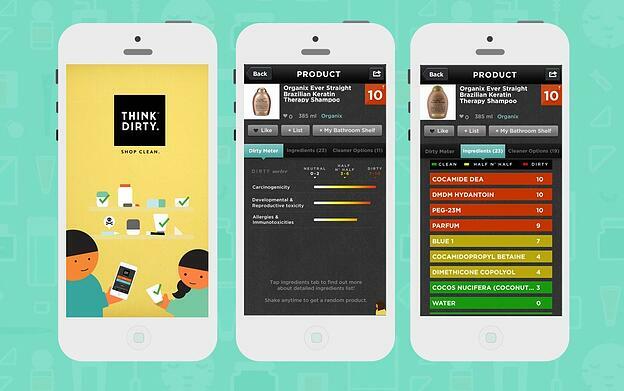 Think Dirty is “an unbiased product-comparison app for cosmetics and personal care products,"(Think Dirty, 2017). The app is designed to help people like myself navigate their way through their beauty products and personal care products, and to find out what products contain harmful ingredients. When you open the app, you swipe through pages that instruct you on how to start using Think Dirty. You get start in your bathroom and scan the products you currently have. You will then receive a rating of how “Dirty” your bathroom is on a scale of 1-10. The app gives you a clear understanding of the rating system. Starting with 0-3, those products do not contain any known controversial or harmful ingredients. Next on the scale is 4-7, whose ingredients have moderate long-term health impacts. Last is 8-10, meaning those ingredients have serious long-term health impacts. This app is truly a good source of information to open your eyes and see how harmful your everyday products could be, (Think Dirty, 2017). I mentioned earlier that I see a holistic doctor and how he opened my eyes up to going natural and organic. My doctor found that I had Acetate in my heart and that the chemical was causing my heart to react poorly. After I found this out, I went home and used the Think Dirty App to raid my products. I came to find out that almost everything I was using contained Acetate including my Hempz hand lotion and Clear Scalp shampoo and conditioner. The app also gives you ingredient info and how the ingredients can affect your body. Acetate has a long list of long-term negative effects to one’s body. This app helped me realize all the affects that ingredients can cause and because of the Think Dirty app, I have thrown away most of the products that I found in my bathroom. The Think Dirty app has great features along with the helpful information that is given through the app. The app has a “Personal Assistant” feature if you sign up, which is there to keep track of your favorite products and keep organized lists to help you out (Think Dirty, 2017). The app also allows you to shop for products online through Amazon and get them directly delivered to you! How amazing is that? I like that the Think Dirty app is constantly staying up-to-date with rating changes based on new findings and formulas from manufacturers. If you’re someone like me, and is learning about their body and what works for them, this app is designed to help you. It has been made crystal clear to me that there are thousands of products sold that contain harmful ingredients and formulas. It’s hard to listen to your body but when actual symptoms begin to show from using a certain product, you should take the initiative to learn more and that’s what this app has done for me and I hope it will do the same for you. Overall, I think the app has more pros than cons. The app is designed to help educate their users. After using the app, I like the scaling system that is used. The numbers used within the scaling system are clear and give the levels of toxicity, allergens and carcinogens. I like the fact that you can scan your products and receive the number immediately. I’ve tried other sites where I had to search through a database of thousands of products until I found the one I was looking for. This app makes it so much easier for the user to quickly find out the information they’re searching for. A con for me would be that not all the products scanned for me. I did have to manually enter information which takes some time and then you have to wait for the product to be reviewed. Another feature about the app that I feel is a con for me is the fact that I have a profile. I don’t really see the point of having a profile, I’m using the app to find products that are safe for myself. I like the layout of the app, you have your profile and that gives you a list of badges you can earn with the number of scans, likes on products, the scans you have completed and your friends. I also like that on the homepage, there is a list of products that are trending now. For someone like me who is very picky about what they use, this is a great resource. I like using the app for the trending products because I know the products are going to be natural, organic, free of parabens, carcinogens, cruelty free, gluten free and vegan. Those are the types of products that the app features and they let you know exactly what’s in them. It’s really helpful and makes me less stressed when I start the process of finding a new product. There are many products out there that have toxic ingredients that can cause Breast Cancer, and that’s scary. That's why I also think a pro for the app is that they partnered with a San Francisco non-profit Breast Cancer Fund. The fact that the app has partnered with this charity makes me feel good about the products I’m choosing. It is an enjoyable experience using this app, which is why I recommend it to friends and now you! Read more about Think Dirty here and the Breast Cancer Fund here.